An easy and quick pasta dish is a staple in a pasta loving house like ours and nothing could be easier nor more comforting than pasta carbonara. You can have a bowlful in the length of time it takes for water to boil and pasta to cook. My daughter wanted spaghetti last week but I didn’t have time nor the inclination to make marinara sauce and we didn’t have any of the bottled variety in the pantry either. So I told her to consult her cookbook (she had bought the Essential Pasta Cookbook (Essential Cookbook) sometime ago) and this is what she came up with. We had all the ingredients she needed too so off we went. 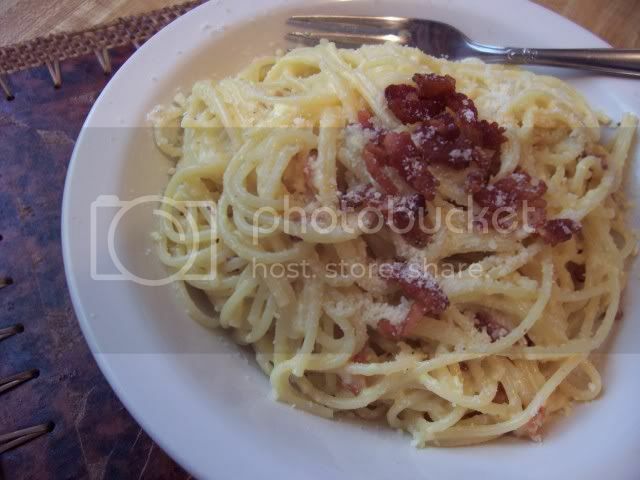 As I was reading the recipe, I realized it didn’t have lemon like our other carbonara recipe. Rather than messing with this one, I decided to go with the recipe and let my daughter do most of the work. It is going to be her meal and from her cookbook, after all. The dish turned out well, The Clone did an outstanding job following the recipe. All I did was drain the pasta and cleaned up after her. Everyone ended up eating pasta, even the non-pasta lovers in our family. We all agreed though that the version with lemon had a fuller taste than this one. For a quick weeknight fill me up though, this one fits the bill nicely. Cook pasta in rapidly boiling, salted water until al dente. In the meantime, cut the bacon into strips and cook in a heavy pan until crisp. Drain on paper towels. Empty the pan of the rendered oil and reserve the pan. In a large bowl, beat the eggs, Parmesan and cream until well combined. When the pasta is cooked, drain it slightly and add it to the mixture in the bowl. Toss gently until the sauce coats the pasta. Return the pasta mixture in the pan where you cooked the bacon and cook on low heat for about a minute or two until the sauce thickens. Season to taste with cracked black pepper and salt. Sprinkle more Parmesan cheese on top before serving. Hi lalaine, yes, the pasta has to piping hot and yes, the eggs cook well enough in the heat. What I do is, I take the pasta directly from the boiling water and into the bowl with the sauce. Don’t worry if it’s not thoroughly drained as the hot water also helps in the cooking and in keeping the pasta moist. I too am always concerned with having the eggs thoroughly cooked especially when serving to kids so, as in the instructions above, I usually dump the bowl of pasta and sauce back into the pan to cook for a minute or two. This ensures thorough cooking and also serves to thicken the sauce if it happens to be too loose. If it’s too dry though, just add a bit more of the hot water that you boiled the noodles in. Wow! Sounds so simple! I am just wondering, the eggs get to cook well enough here? I am assuming pasta has to be very hot. Thanks for sharing. This pasta is dinner tonight at my house! You must be proud of your clone! Great job there, I’d say! I have not tried preparing carbonara either. I have tasted it a few times in a friend’s home back when I was still in the Philippines. I should try it one of these days. I am sure my kids will love it. But I probably will try your other recipe. I’m Italian and have never eaten this. I have to try it now that I’ve seen the recipe.